In front of the Bellbrook student section, Beavercreek’s Chris Herbort fires a 3-pointer, in first-half action Feb. 9 at Bellbrook High School. Herbort led Beavercreek with 13 points in a 55-39 win. Golden Eagles senior T.J. Nagy weaves through a pair of Beavercreek defenders and scores, Feb. 9 in a high school boys basketball game at Bellbrook High. Beavercreek’s Brayden Walther puts up a shot try in the first half of a boys high school basketball game, Feb. 9, in Bellbrook. 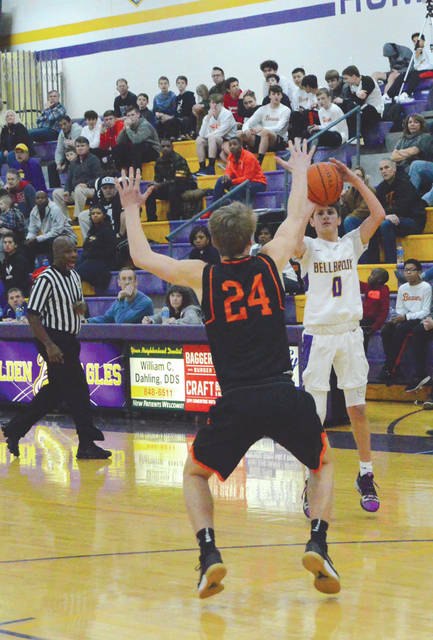 Bellbrook freshman Ryan Chew (0) and senior teammate T.J. Nagy led the Golden Eagles with nine points each in Saturday’s home loss to Beavercreek. 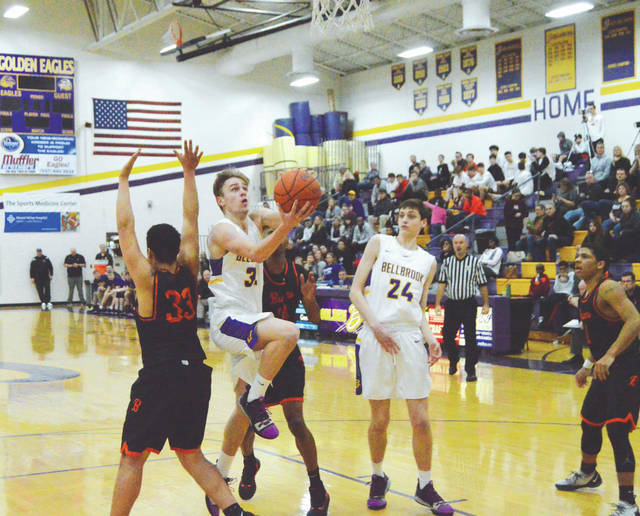 BELLBROOK — Area coaches Donnie Tate of Bellbrook and Mark Hess of Beavercreek were looking for a good non-league battle that would test their teams’ mettle, before the postseason tournaments come up in a couple weeks. Hess needed a good road contest against a fiesty opponent with a tough crowd. Tate wanted to face a big-school opponent, in hopes of toughening his youthful team up. Both found what they were looking for, as Beavercreek rallied to a 55-39 win, Feb. 9 at Bellbrook High School. Beavercreek’s Hess said things didn’t quite go according to plan, however. With an inside bucket from T.J. Nagy, two scores from Kevin Urbaniak, and a rebound putback from Hayden Greene, Bellbrook (5-15) grabbed a 12-4 lead in the first quarter. Beavercreek chipped away at that lead to pull within 11-14 after eight minutes of play, however. An inside score from Mali Harris-Strayhorn at the 6:26 mark of the second quarter provided the Beavers (6-13) with their first lead of the game, 15-14. 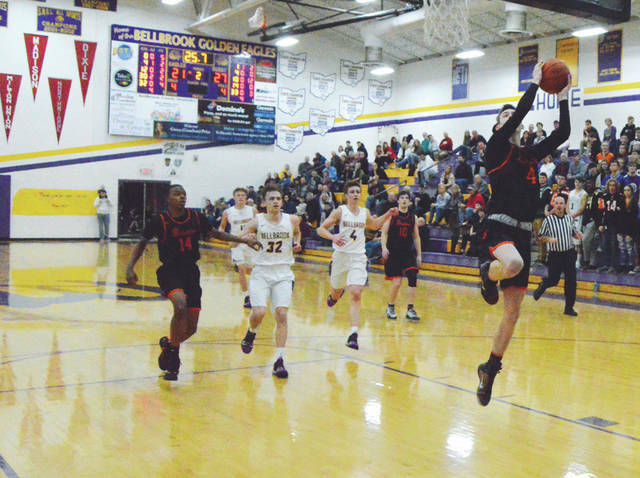 Bellbrook freshman guard Ryan Chew buried a 3-pointer from the right side with five minutes left in the first half to notch things up at 17-all, but the Golden Eagles never got another lead. Beavercreek closed out the first half with an 11-4 run to take control of the game. Despite not scoring a point in the second half, Beavercreek junior guard Chris Herbort led the Beavers with 13 points. Junior Yousef Saleh and seniors Brandon Zink and Brentin Seman each finished with eight points, and Harris-Strayhorn added seven. Tate said he appreciates when Division I schools are willing to come and play his D-II squad. Tate said Bellbrook has Kettering Fairmont, another talented D-I school, on the regular season schedule next season. On this night, Golden Eagles freshman Ryan Chew and senior T.J. Nagy both scored nine points, and junior guard Evan Lakins scored seven, to lead Bellbrook, who returns to Southwestern Buckeye League play with a 7:15 p.m. crossover game with Preble Shawnee on Tuesday, Feb. 12 in the Bellbrook High School gym. The Golden Eagles will then close out the regular season schedule with yet another home contest, at 7:15 p.m. Friday, Feb. 15 against SWBL Southwestern division foe Monroe. Beavercreek also wraps up its regular season slate at home. 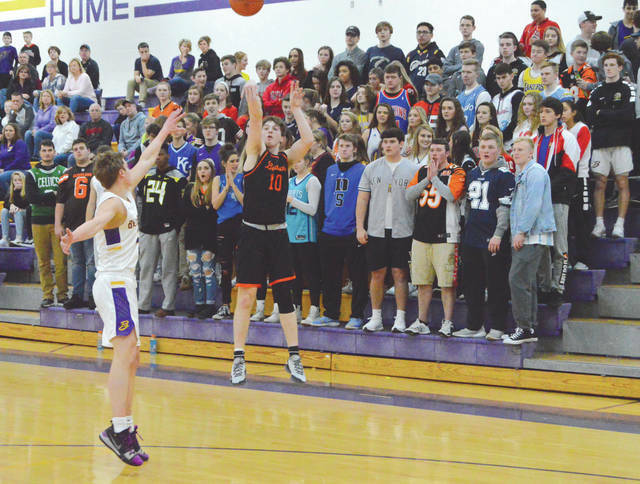 In a trio of 7:30 p.m. contests, the Beavers host Centerville on Tuesday, Feb. 12, then Fairmont on Friday, Feb. 15 before taking on Little Miami for a nonleague contest on Saturday, Feb. 16.